Now in its 47th year, HCSSiM is an intensive six-week encounter with college-level mathematics for talented and highly motivated high school students. It is demanding and expanding. Participants spend a major portion of each day actively engaged in doing mathematics (not simply learning the results of mathematics). HCSSiM students live in the dorms at Hampshire College in Massachusetts for six summer weeks, and study and play in its fields, woods, and academic buildings (not typically in that order). The daily schedule includes 4 hours of morning classes (Mon-Sat), the pre-supper Prime Time Theorem, and evening problem sessions. Afternoons are devoted to reading, rest, recreation, occasional trips to town, and informal study. Participants have unparalleled access to faculty members in classrooms, at meals, and in the program dorm. Productive collaborations continue long after the program, and many lifelong friendships are forged. Our alumni come from (and end up) all around the world, but remain close in spirit. 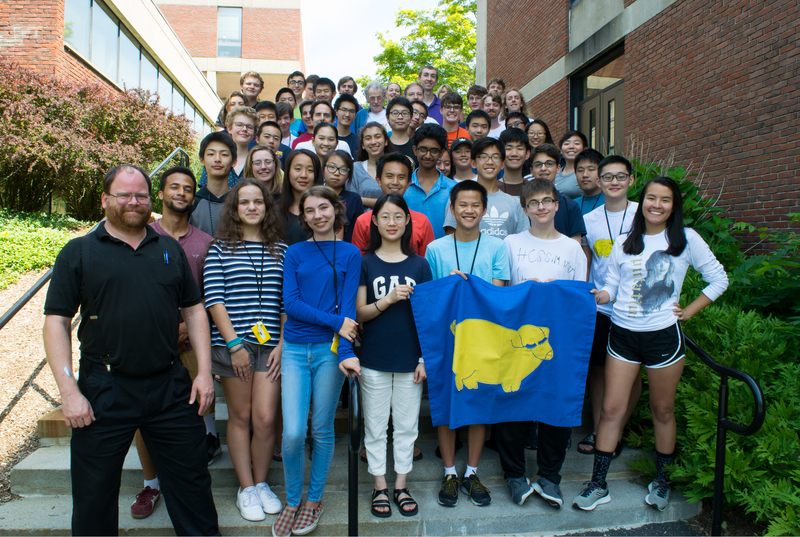 Those who have the means to make it back to Hampshire College join us for Yellow Pigs Day in July, and so students have an opportunity to meet (and sing carols, play frisbee, juggle… with) notables in math, science, tech, and many more fields. The 47th HCSSiM will happen June 30 – August 10, 2019. Applying is fast, free, fun, obligationless, and doable online even while other options are being explored. Not applying unnecessarily closes doors, means not seeing the 2019 Interesting Test, and may cause drowsiness and boredom. ©2018–2019 HCSSiM. Stay in touch.